Now share your games too. Steam Family Library Sharing allows family members and their guests to play one another's games while earning their own Steam achievements and saving their own game progress to the Steam Cloud. It's all enabled by authorizing shared computers and users. For more information about Steam Family Library Sharing, check out the FAQ below, and then join the conversation in our group discussions. See a family member's installed game that you want to play? Send them a request to authorize you. Once authorized, their library of Steam games becomes available for you to access, download and play. MartinO's shared games are now available for you to play on this computer. How do I enable Family Library Sharing on my computer? To enable Family Library Sharing, first be sure you have Steam Guard security enabled via Steam > Settings > Account in the Steam Client. Then enable the sharing feature via Settings > Family, (or in Big Picture mode, Settings > Family Library Sharing,) where you'll also authorize specific computers and users to share. Is there a limit to the number of devices or friends I can authorize to share my Library? Yes. You may authorize Family Library Sharing on up to 10 devices at a given time, and for up to 5 accounts that may then use your game library on any of your authorized computers. Do I need to be online to play a shared game? Yes. You must be online to access and play games which are shared with you. Can I share specific games, or do I have to share my whole library? Libraries are shared and borrowed in their entirety. Can all Steam games be shared with friends and family? No, due to technical limitations, some Steam games may be unavailable for sharing. For example, titles that require an additional third-party key, account, or subscription in order to play cannot be shared between accounts. Can two users share a library and both play at the same time? No, a shared library may only be accessed by one user at a time. 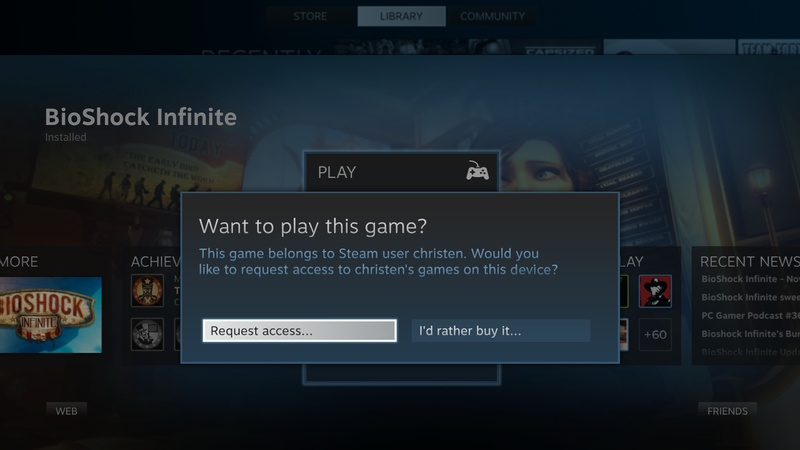 When I authorize a device to lend my library to others, do I limit my own ability to access and play my games? As the account holder, you may always access and play your games at any time. If you decide to start playing when another user is already playing one of your games, he/she will be given a few minutes to either purchase the game or quit playing. Sometimes the games I’ve been given access to are unavailable for me to play. Why? Shared games are only available on devices that have been authorized by the account holder. 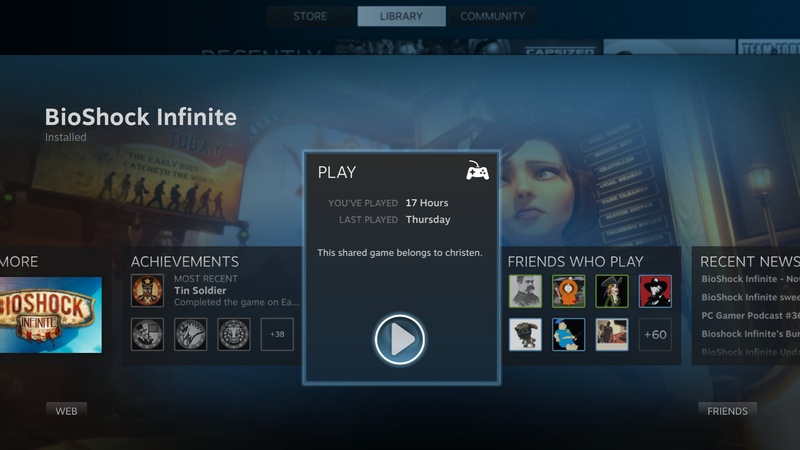 Shared games will be unavailable on even an authorized device when the account holder’s library is currently in use on another computer. Who owns and can access the DLC and in-game content associated with a shared title? A guest will have access to the lender's DLC, but only if the guest doesn't also own the base game. Guests may not purchase DLC for a base game they don't own. Any player may purchase, trade, earn, or otherwise acquire in-game content while playing a game, but in-game items cannot be shared between accounts. These items remain the property of the account that purchased or acquired them, whether borrowing or lending the base game. Can region-restricted content be shared across regions? No, any region restrictions will remain in place when lending or borrowing content. Will I be punished for any cheating or fraud conducted by other users while playing my games? Your Family Library Sharing privileges may be revoked and your account may also be VAC banned if your library is used by others to conduct cheating or fraud. Additionally, VAC-banned games cannot be shared. We recommend you only authorize familiar computers you know to be secure. And as always, never give your password to anyone.